The esophagus (a.k.a. oesophagus, food pipe, and gullet) is a long, hollow organ which transports food from the mouth to the digestive system. Typically, the esophagus travels directly from the mouth to the digestive tract. Some animals do not have a specialized stomach region, and the esophagus dumps directly into the intestines. In higher animals, the esophagus carries food through the thoracic cavity to the stomach. In animals with lungs, the esophagus and the larynx are separated after the pharynx, which exists near the back of the throat. In the diagram below of the human digestive system, the esophagus is highlighted. The esophagus is formed from several layers of cells originally derived from the endoderm, or innermost cell layers of the embryo. The innermost cells develop into a mucosa, or lining which separates the body from the food being digested inside. 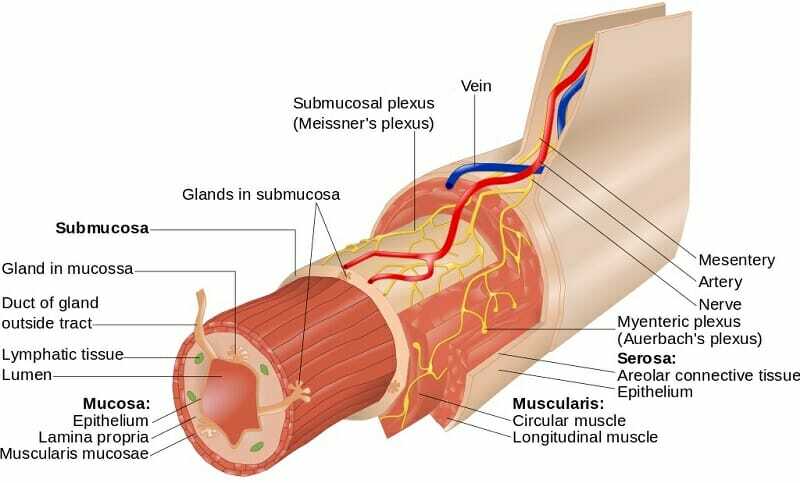 On top of that is the submucosa, which contains connective tissues allowing the attachment of various muscles, veins, nerves, and other connective tissues. The overall structure of the esophagus can be seen below. The esophagus is controlled by a number of nerves, which control both peristalsis and supply signals back to the brain about food in the esophagus. The vagus nerve controls peristalsis, or the squeezing contraction of the digestive tract. 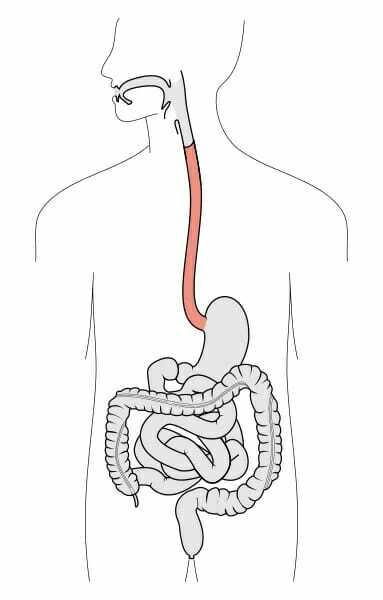 The sympathetic trunk is a series of nerves which send signals back from the esophagus to the brain, and help control the periodic contractions of the esophagus and other parts of the digestive tract. The esophagus is an important connection to the digestive system through the thoracic cavity, which protects the heart and lungs. The esophagus carries food through this cavity, keeping it separate and moving it through with muscular contractions. Two sphincters on either side of the esophagus separate food into small units known as a bolus. The size and complexity of the esophagus varies by species. Larynx – The start of the tube leading to the trachea and lungs, which houses the vocal cords in some animals. Pharynx – The specialized region of the throat in which the esophagus and larynx connect. Trachea – Below the larynx, which leads into the bronchi of the lungs. Peristalsis – The muscular contractions which move food through the digestive system by systematically contract the smooth muscle surrounding the digestive tract. 1. Art and science often intersect in society. In many stories and artistic works, a human gets swallowed by an animal, and must pass through their digestive tract, arriving safely on the other side. While this is hardly possible, it is certainly more feasible with some animals than others. Which of these animals has an esophagus which makes this a more feasible story? A is correct. Snakes, like other reptiles, swallow their food whole. This means that their esophagus must be able to expand to many times its size to be able to accommodate the large meals that the snakes intake. Sharks use a much different method to eat food. Their many rows of teeth serve as a large serrated knife, and they rip their head back and forth to remove large chunks of flesh. Whales are either baleen whales, which filter very small meals from the water, or toothed whales which use sharp teeth to catch bite-size prey or tear apart larger prey. In both B and C, a human could not even survive a trip through the mouth, let alone esophagus. Some snakes are known to grow large enough to eat a human, which at least makes the swallowing a person whole part of the story feasible.